Crispy Tacos are always fun! It’s been a while. My blog needs a face lift. Anyways, queen Bee Courtney came to visit from her metal throne this winter. Apparently there wasn’t so much snow in NY. And per usual, a dinner for parting friends is necessary and after a great Chinese hotpot, I figured I would take to a fusion food. Duck has to be my favorite meat. It’s more rare around the house, so anytime I get a chance, I always stock up on duck. To properly say goodbye (for now) in the most backhanded way that says “this is your last decent meal before the top ramen sets back in,” I made red braised duck in wonton taco shells. Simple technique, with a host of different and unfamiliar ingredients. Dark Meat is better here, but if you do use the breast take it out sooner! 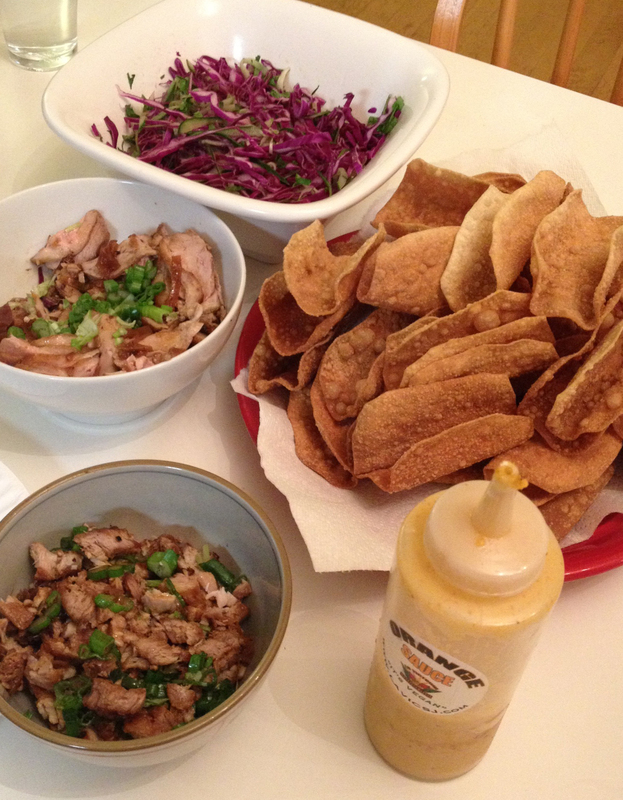 First, marinade the duck in all the ingredients (except the wontons duh) in a mixing bowl. Toss it around so everything gets mixed well and set it aside for maybe an hour or so. Then after, remove the duck from the marinade, reserving the marinade. In a hot pot, heat oil on medium high and start to brown the outside of the duck pieces. You’re probably going to have to rotate often. Once the meat is browned, deglaze with marinade. Let the onions brown, turning the heat down to medium low. Then add water until it’s just about level with the meat. Cover , bring to a boil, and reduce the heat to low. Let this braise for 40 mins to an hour. The longer the better! Add water as necessary to prevent burning. If you can, pick up some Orange Sauce from La Vic’s! In the mean time, how I fried my wontons was a new technique I learned (from the internet no less). 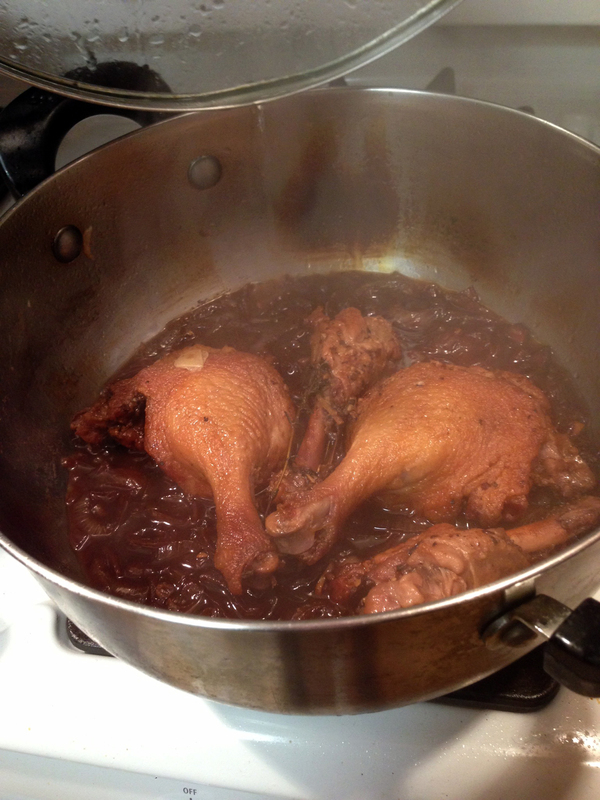 In a small sauce pot, add a neutral flavor oil, about 3 or 4 inches high. Heat to about 350F. I used a thermogun to check because we’re fancy. Then I just plopped one wonton sheet on the surface, and using a flat, wooden spatula and submerge the wonton by pressing down in its center. The sides should come up around the spatula because of the bubbles! Fried until golden brown, less than 40 seconds usually. I used the same marinade on pork for Elle, she doesn’t like duck so much. The pork was great too! To prepare the meat, just take two forks and pull the duck meat from the bone. Assemble your tacos! 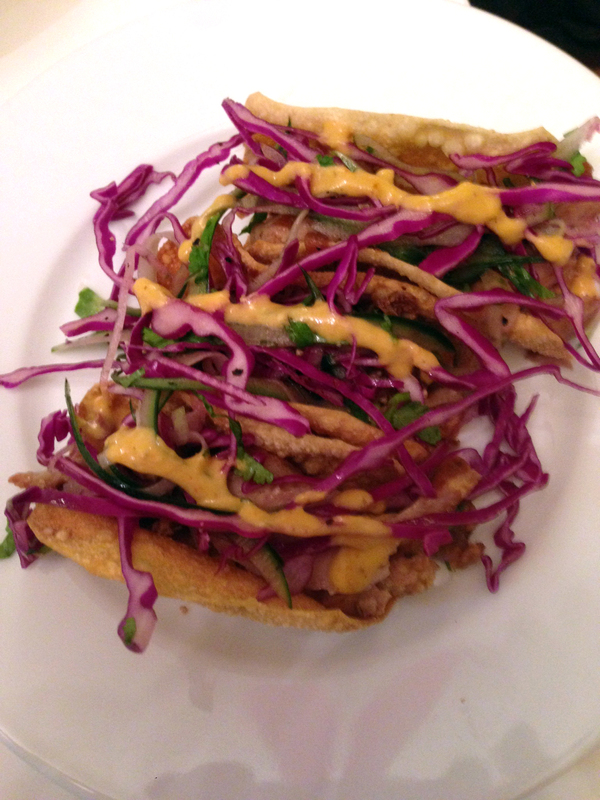 I garnished with a red cabbage lime slaw. Also, thanks to Ellie, we have this amazing sauce called Orange sauce from La Vics. It when very well with our duck tacos! Give it a try. There more to come as well! This is the best thing that I’ve ever eaten in my entire life. Thanks Robert. This message has been approved by Queen Bee Courtney. 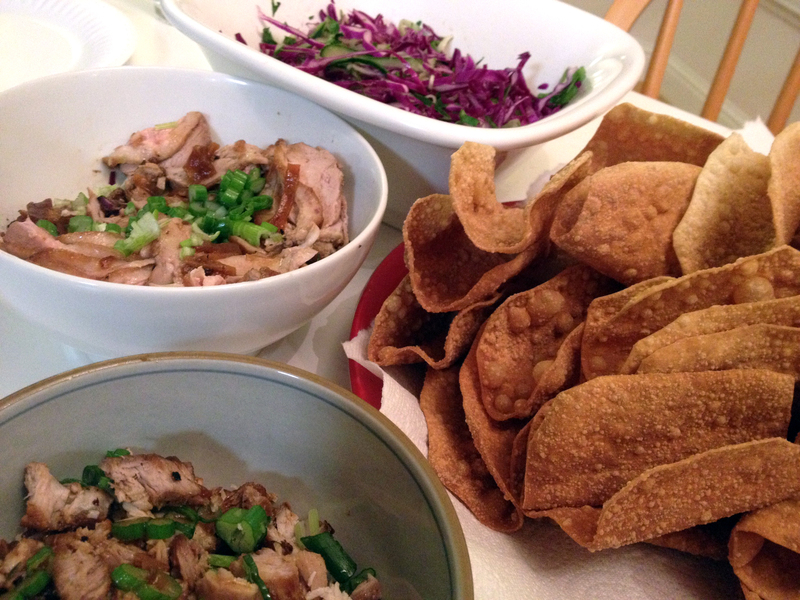 This entry was posted on February 8, 2013 by rrfoods in Dinner, Lunch and tagged black bean, braised, chinese, crispy, duck, pork, shaoxing, soy sauce, tacos, wonton.